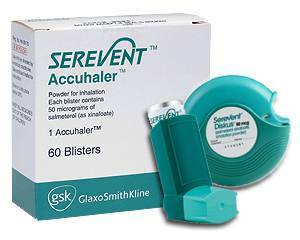 Serevent is a long-acting bronchodilator. The active substance salmeterol comes directly in the lungs by inhalation, and acts by up to 12 hours or longer. Many other bronchodilators have an activity of about 4 hours. Serevent helps to keep the airways open so you can breathe freely again. It prevents breathlessness and wheezing. The Serevent inhaler is used at least once daily. Depending on the severity of the condition, the doctor will determine the dosage. Before you start to inhale, breathe quietly. On top of the diskusinhaler includes a counter, so you can see exactly how many puffs are still available. After Serevent is used, you must rinse the mouth with water, to prevent fungal and / or hoarse. The dosage depends on the severity and type of condition and will be determined by the physician. Adults and children aged 4-12 years taking as usual 1 inhalation twice daily. For children younger than 4 years, the use of Serevent is not recommended. Adults who suffer from COPD (chronic obstructive pulmonary disease, including bronchitis and emphysema) use 1 inhalation twice daily. To use the right dosage, it's important that you have regular checkups by your doctor. If you haven’t used Serevent previously, an allergic reaction may occurs (this is however very rare). The breathing may deteriorate or you could suffer from itching and / or swelling in the face. If you suffer from these side effects you should immediately inform your doctor. The most common side effects of Serevent are: muscle cramps, weakness (palpitations), headache and / or tremor (shaking hands). These side effects don’t stay long and will possible disappear if you use the treatment for a long time. Consult a doctor before you use Serevent during pregnancy or breastfeeding. Serevent is not suitable for children younger than 4 years old.